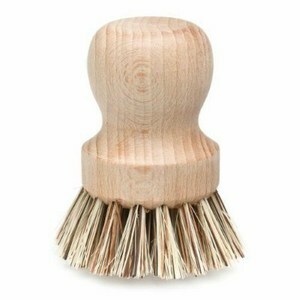 Fabulous little Pot Brush made ​​with FSC beech wood handle and natural plant fibers. Perfect for use as a pot scourer for crusted on food. Handy Hint : even easier if you have burnt the bottom of the pot – sprinkle with a layer of bicarb – wet and leave to soak for a couple of hours. Job done. Maintenance: Every 6 months apply a thin layer of linseed oil to the handle and leave to dry. Has been FSC certified: which ensures that the management of the forest where trees used to produce this product has followed a series of principles and based on environmental, social and economic criteria are respected forest. This is another Redecker product so quality guaranteed.